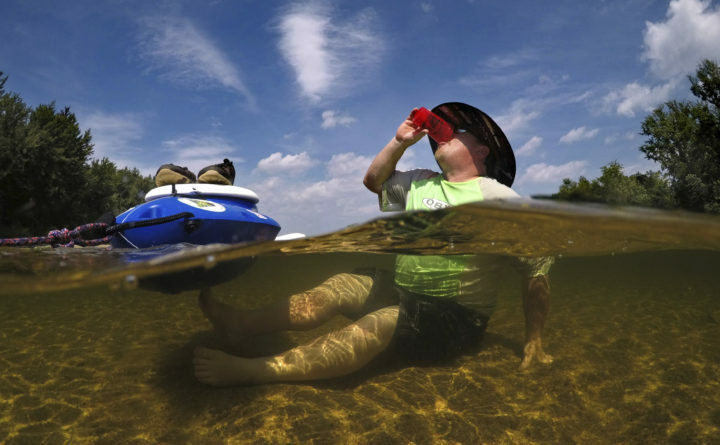 David Hoyt of Reading, Mass., enjoys an ice-cold seltzer water while seated alongside his anchored cooler in the Saco River in Fryeburg, Maine, where the temperature was 93 degrees F but the heat index made it feel like 103, Tuesday, Aug. 28, 2018. Much of New England is enduring a heat wave during the unofficial final week of summer, with Maine officials issuing an air quality alert for Wednesday, Aug. 29. Ozone concentrations at ground level are predicted to increase in Maine Wednesday and are expected to reach unhealthy levels along the coast, according to the Maine Department of Environmental Protection. Ozone levels began building Tuesday afternoon in the New York City/Long Island Sound area, DEP officials said in a release. Winds are expected to bring these high levels of ozone to Maine and travel down the coast Wednesday. Temperatures were near or above 90 degrees Fahrenheit in much of Maine on Monday and Tuesday, and they are expected to continue reaching into the 90s on Wednesday, according to forecasters. 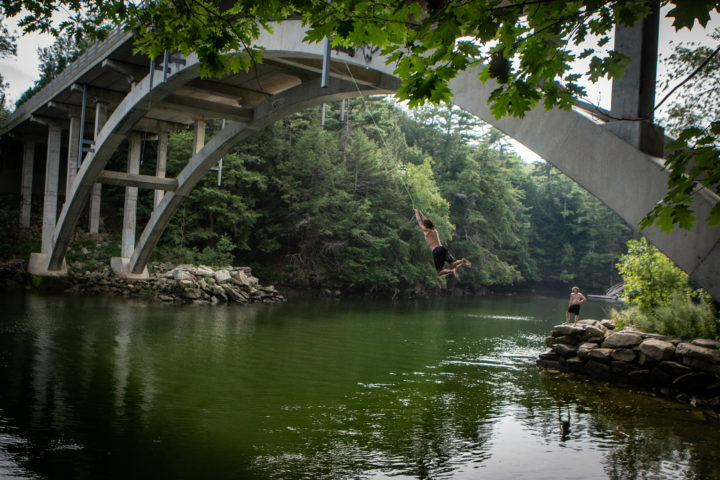 Mykel Henry of Falmouth swings under a bridge before jumping into the Presumpscot River between Portland and Falmouth on Tuesday afternoon. Particle pollution levels Wednesday are expected to be moderate statewide, and heat advisories have been issued by the National Weather Service. This combination of heat, humidity and poor air quality will exacerbate the effects of each factor. People who may be affected are advised to adjust their schedule to avoid strenuous outdoor activity during the afternoon. Sports coaches, eldercare workers, nurses and others who are responsible for the welfare of people affected by poor air quality are urged to consult DEP’s air quality forecast online at www.maine.gov/dep/air/ozone or by using Environmental Protection Agency’s air quality app, m.epa.gov/apps/airnow.html . More information about the risks of poor air quality can be found online at www.maine.gov/dhhs/mecdc or www.epa.gov/asthma. DEP’s toll free air quality hotline is 1-800-223-1196.